This is a Qwiic breakout board based on PAJ7620U2. It can recognize 9 human hand gesticulations such as moving up, down, left, right, forward, backward, circle-clockwise, circle-counter clockwise, and waving. The normal gesture detecting range is 5 to 15 cm, and the operating view angle is at 60° diagonally. 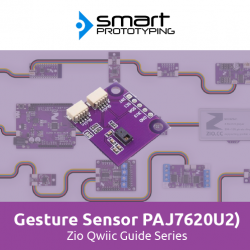 The PAC7620 also offer built-in proximity detection for the purpose of sensing an object approaching or departing. As it is a Qwiic compatible module, you can use Qwiic cable to daisy chain it with other Qwiic devices, no need soldering and jumper wire connecting!